ABOVE: NOAA’s Geostationary Operational Environmental Satellite-16, or GOES-16, watches the Sun’s upper atmosphere — called the corona — at six different wavelengths, allowing it to observe a wide range of solar phenomena. GOES-16 caught this footage of an X9.3 flare on Sept. 6, 2017. This was the most intense flare recorded during the current 11-year solar cycle. X-class denotes the most intense flares, while the number provides more information about its strength. An X2 is twice as intense as an X1, an X3 is three times as intense, etc. GOES also detected solar energetic particles associated with this activity. NASA – September 2017 saw a spate of solar activity, with the Sun emitting 27 M-class and four X-class flares and releasing several powerful coronal mass ejections, or CMEs, between Sept. 6-10. Solar flares are powerful bursts of radiation, while coronal mass ejections are massive clouds of solar material and magnetic fields that erupt from the Sun at incredible speeds. The activity originated from one fast-growing active region — an area of intense and complex magnetic fields — as it travelled across the Sun’s Earth-facing side in concert with the star’s normal rotation. As always, NASA and its partners had many instruments observing the Sun from both Earth and space, enabling scientists to study these events from multiple perspectives. With multiple views of solar activity, scientists can better track the evolution and propagation of solar eruptions, with the goal of improving our understanding of space weather. Harmful radiation from a flare cannot pass through Earth’s atmosphere to physically affect humans on the ground, however — when intense enough — they can disturb the atmosphere in the layer where GPS and communications signals travel. On the other hand, depending on the direction they’re traveling in, CMEs can spark powerful geomagnetic storms in Earth’s magnetic field. To better understand the fundamental processes that drive these events, and ultimately improve space weather forecasts, many observatories watch the Sun around the clock in dozens of different wavelengths of light. Each can reveal unique structures and dynamics in the Sun’s surface and lower atmosphere, giving researchers an integrated picture of the conditions driving space weather. Scientists also have their eyes on the Sun’s influence on Earth and even other planets. Effects from September’s solar activity were observed as Martian aurora and across the globe on Earth, in the form of events known as ground-level enhancements — showers of neutrons detected on the ground, produced when energetic particles accelerated by a solar eruption stream along Earth’s magnetic field lines and flood the atmosphere. The imagery below shows the wide swath of views available to researchers as they use these recent space weather events to learn more and more about the star we live with. NASA’s Solar Dynamics Observatory watches the corona at 10 different wavelengths on a 12-second cadence, enabling scientists to track highly dynamic events on the Sun such as these X2.2 and X9.3 solar flares. These images were captured on Sept. 6, 2017, in a wavelength of extreme ultraviolet light that shows solar material heated to over one million degrees Fahrenheit. The X9.3 flare was the most intense flare recorded during the current solar cycle. JAXA/NASA’s Hinode caught this video of an X8.2 flare on Sept. 10, 2017, the second largest flare of this solar cycle, with its X-ray Telescope. The instrument captures X-ray images of the corona to help scientists link changes in the Sun’s magnetic field to explosive solar events like this flare. The flare originated from an extremely active region on the Sun’s surface — the same region from which the cycle’s largest flare came. Key instruments aboard NASA’s Solar and Terrestrial Relations Observatory, or STEREO, include a pair of coronagraphs — instruments that use a metal disk called an occulting disk to study the corona. The occulting disk blocks the Sun’s bright light, making it possible to discern the detailed features of the Sun’s outer atmosphere and track coronal mass ejections as they erupt from the Sun. On Sept. 9, 2017, STEREO watched a CME erupt from the Sun. The next day, STEREO observed an even bigger CME, which was associated with the X8.2 flare of the same day. The Sept. 10 CME traveled away from the Sun at calculated speeds as high as 7 million mph, and was one of the fastest CMEs ever recorded. The CME was not Earth-directed. It side-swiped Earth’s magnetic field, and therefore did not cause significant geomagnetic activity. Mercury is in view as the bright white dot moving leftwards in the frame. Like STEREO, ESA/NASA’s Solar and Heliospheric Observatory, or SOHO, uses a coronagraph to track solar storms. SOHO also observed the CMEs that occurred during Sept. 9-10, 2017; multiple views provide more information for space weather models. As the CME expands beyond SOHO’s field of view, a flurry of what looks like snow floods the frame. These are high-energy particles flung out ahead of the CME at near-light speeds that struck SOHO’s imager. NASA’s Interface Region Imaging Spectrometer, or IRIS, peers into a lower level of the Sun’s atmosphere — called the interface region — to determine how this area drives constant changes in the Sun’s outer atmosphere. The interface region feeds solar material into the corona and solar wind: In this video, captured on Sept. 10, 2017, jets of solar material appear like tadpoles swimming down toward the Sun’s surface. These structures — called supra-arcade downflows — are sometimes observed in the corona during solar flares, and this particular set was associated with the X8.2 flare of the same day. NASA’s Solar Radiation and Climate Experiment, or SORCE, collected this data on total solar irradiance, the total amount of the Sun’s radiant energy, throughout Sept. 2017. While the Sun produced high levels of extreme ultraviolet light, SORCE actually detected a dip in total irradiance during the month’s intense solar activity. A possible explanation for this observation is that over the active regions — where solar flares originate — the darkening effect of sunspots is greater than the brightening effect of the flare’s extreme ultraviolet emissions. As a result, the total solar irradiance suddenly dropped during the flare events. Scientists gather long-term solar irradiance data in order to understand not only our dynamic star, but also its relationship to Earth’s environment and climate. NASA is ready to launch the Total Spectral solar Irradiance Sensor-1, or TSIS-1, this December to continue making total solar irradiance measurements. The intense solar activity also sparked global aurora on Mars more than 25 times brighter than any previously seen by NASA’s Mars Atmosphere and Volatile Evolution, or MAVEN, mission. MAVEN studies the Martian atmosphere’s interaction with the solar wind, the constant flow of charged particles from the Sun. 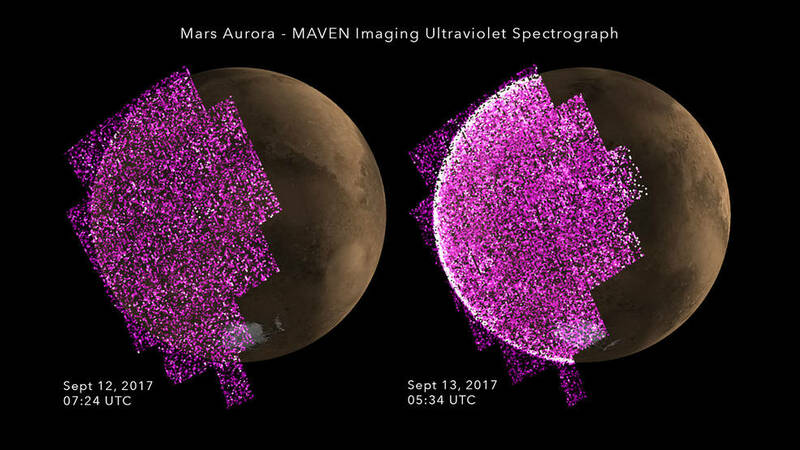 These images from MAVEN’s Imaging Ultraviolet Spectrograph show the appearance of bright aurora on Mars during the September solar storm. The purple-white colors show the intensity of ultraviolet light on Mars’ night side before (left) and during (right) the event.